Kettering is a city of Montgomery and Greene counties in the state of Ohio, United States. 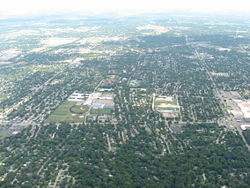 It is a suburb of Dayton. 56,163 people lived there in the 2010 census. This growth was due in part to the many people who started migrating out of nearby Dayton after World War II. ↑ "American FactFinder2". Retrieved 2010-03-20. This page was last changed on 18 March 2018, at 20:10.